The workshops detailed below went ahead successfully in February. They were well over subscribed showing that there is strong interest in the Alexander Teaching community for working with people living with Parkinson’s. Sponsorship from ParkinsonsUK has paid for 6 lucky individuals with Parkinson’s to receive 10 lessons at no charge from teachers who attended the workshop. In advertising for those pupils the opportunity was taken to contact over 240 organisations and individuals thereby spreading the word that Alexander Technique is not only in the NICE guidelines but teachers are out there looking for pupils! Lessons given as far afield as London, Bristol, Cumbria and Dorset. 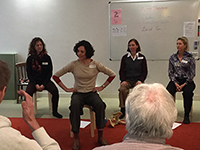 Following on from previous workshops and activities, The Walter Carrington Educational Trust is subsidising places for ten STAT- registered teachers to participate in two workshops around teaching the Alexander Technique to pupils with Parkinson’s Disease. Both workshops must be taken together. Special training will be given in the mornings, followed by hands-on experience with people living with Parkinson’s in the afternoons. Maximum ten teachers. A certificate of attendance will be given. Please note, only limited places remain on this workshop as they were initially offered to those who registered their interest last year. If you would like to apply, please read all information on this page carefully. A small amount of home study before the start of the programme will be recommended and links to the recommended material will be provided. Please make sure that you can commit to coming on both days. Cost of Training: £250, of which £50 will be covered upfront by the Walter Carrington Educational Trust. The balance of £200 to pay covers both workshops, which must be attended. 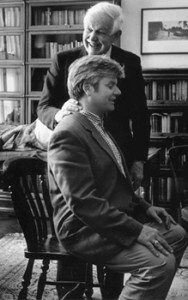 Alexander Technique is one of the only modalities that is in the NICE guidelines for Parkinson’s Disease. This training is designed to better equip you to meet the specific needs of people living with Parkinson’s. You will come away with some practical strategies and increased confidence, and will be more aware of the particular considerations that need to be taken into account, including awareness around health and safety aspects. The workshops will give you a general understanding of Parkinson’s symptoms, current treatments and how they assist, including some of the medications used and their possible side effects. You will hear about the day-to-day challenges of living with Parkinson’s and learn about the ways in which the Alexander Technique can be best adapted to meet them, from teachers who have experience teaching pupils with the condition. We will make reference to research that has been conducted into the effectiveness of Alexander Technique for people with Parkinson’s. In the afternoon sessions, you will have the opportunity to meet and listen to people affected by Parkinson’s, and gain some first-hand, practical, supervised experience in working with them in a workshop setting. The training will give you the knowledge required to structure your lessons according to the needs of your pupils affected by Parkinson’s, to help keep them safe and to address their particular needs more effectively. The knowledge, understanding and skills learnt in the workshops could help in building a good rapport with these pupils. The insights you gain will help you to help them manage their condition better and get more out of life by learning strategies to address the challenges they face in doing the activities that matter most to them. A short introduction to the programme and what has happened so far. 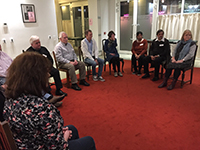 The teachers who have pioneered this initiative with the support of the Trust will share from their experience of working with people living with Parkinson’s, and we will have input from some of the first group of teachers who trained with us in 2018. The morning session includes an overview of Parkinson’s Disease symptoms, current treatments (and how they assist), the main medications used and their possible side effects. 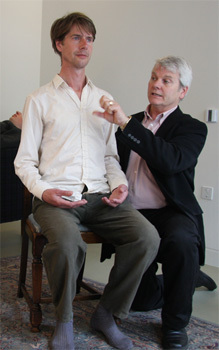 You will hear about the day-to-day challenges of living with Parkinson’s and explore ways in which the Alexander Technique can be taught, with consideration of feedback from teachers who have experience teaching pupils with the condition. We will make reference to research that has been conducted into the effectiveness of Alexander Technique for people with Parkinson’s. Approximately 12 people living with Parkinson’s and their carers will be invited to come to a workshop entitled “Living with Parkinson’s – Exploring Possibilities with the Alexander Technique”. This workshop will be led by Liz Dodgson and Loretta Manson, two of the teachers who pioneered this initiative. 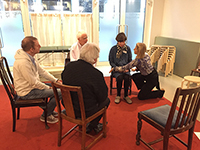 The teachers in the Trust programme will be invited to watch and assist at their own pace, thus having the opportunity to gain one-to-one hands-on experience in working with people with Parkinson’s. Discussion and review of day one. A Parkinson’s specialist will give an introduction to their work – speaker and content to be confirmed nearer the time. 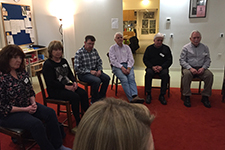 Approximately 12 new people living with Parkinson’s and their carers will be invited to come to a repeat workshop entitled “Living with Parkinson’s – Exploring Possibilities with the Alexander Technique”. Other details as for Day One Afternoon and you will be invited to take a more active role. Liz Dodgson trained with the Carringtons about 16 years ago, and runs a private practice from home and from Roko Gym in Chiswick. She particularly delights in helping people to be able to return to enjoyable, pain-free activity and works regularly with runners in particular. 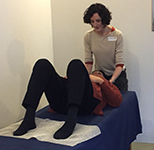 Having had only one student with Parkinsonism during her sixteen years of practice prior to this initiative, she feels that a concerted effort may be needed if the benefits of AT are to be brought to this community. Loretta Manson trained with the Carringtons at the Constructive Teaching Centre in London, graduating in 1997. She teaches at The Bloomsbury Alexander Centre in Holborn and at The Alexander Technique Studio in Wandsworth Common. A keen dancer from childhood, and now very involved with Lindy Hop and Argentine tango, Loretta was diagnosed early on with scoliosis and multiple joint problems. First-hand experience of living with long-term pain and fatigue gives Loretta particular insight into the challenges faced by pupils in need of relief from tension, pain, backache, low energy and mood. Loretta values the Alexander Technique as a constructive approach to managing our individual limitations and living as fully, freely and joyfully as possible. Dai Richards trained with Carolyn Nicholls in Brighton qualifying in 2012 and currently teaches full time in Ditchling near Hove, West Sussex. He has a broad and varied experience of working with movement, injury and recovery. He has an excellent track record of helping people with their painful conditions as well as performance in running, cycling, swimming, dancing, and skiing through the Alexander Technique. Recently Dai has been particularly active in taking AT into the traditional workplace. 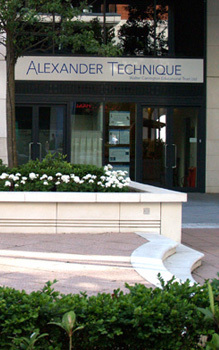 Regina Stratil trained at the Alexander Technique Studio in London, qualifying in 2014, and now runs a private practice at the Alexander-Technik Studio Graz in Austria. She has a particular interest in applying the Alexander Technique to movement and movement difficulties, having a strong movement background herself as a martial arts expert of 25 years’ experience. After studying Chloe Stallibrass‘ research on Alexander Technique and Parkinson’s and participating in a workshop with The Poise Project, she became passionate about the potential benefits of the Alexander Technique to the quality of life of people living with Parkinson’s. Regina had initially been the connecting link to the Walter Carrington Educational Trust and instrumental in moving this initiative forward before moving back to her native Austria in 2018. The deadline for the next round of applications for teacher training at CTC is 15th June 2018. Brigadier Scott Workman OBE is a serving Army office currently working in the Ministry of Defence in the procurement and acquisition area. He has seen operational service in Northern Ireland, Africa, Iraq, Bosnia, Kosovo and Afghanistan. He is currently in his final year of service and taking Alexander Technique lessons. He has three children, and he is a keen offshore sailor. Regina is the administrator of the Constructive Teaching Centre and the administrator the archives. She trained at the Alexander Technique Studio, London, and teaches at the Trust’s Alexander Technique Centre in Imperial Wharf, and at Student Central, former ULU building, in Bloomsbury. Jean is in charge of coordinating all activities at the centre and associated administration. He trained 1984-87 and did two post-graduate terms at Constructive Teaching Centre in 1988. He taught at the Alexander Technique Studio 1997-2012 and is currently teaching on the CTC training courses. 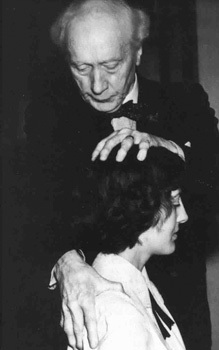 He gives individual lessons at the Pimlico Centre for the Alexander Technique, London. 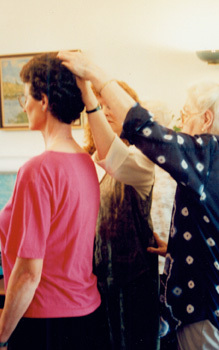 Jean has annotated and edited books on the Alexander Technique, and is the publisher of books on the Technique under the Mouritz imprint. Jean is a previous Congress Director, STAT Council Member, and trustee of the FM Alexander Trust. Gerald qualified as a civil engineering in 1957. He is author of The Energy Question (Penguin, 1976) and has written extensively on energy and environmental issues in the developing world. He taught at the Architectural Association School of Architecture, and has worked for the International Institute for Environment and Development and the Panos Institute. During the 1990s he carried out studies for the World Bank, EU, UN and other international agencies. He was chair of the Board of Trustees of the Panos Institute during the 1990s. He trained as a teacher of the Alexander Technique at the Constructive Teaching Centre and has been a visiting teacher at CTC since 2002. Mary Anne graduated from the Courtauld Institute in 1968. She then worked in the Editorial office of McKinsey. After having two children she taught on the Christie’s Fine Arts Course, was a freelance lecturer in Art History and started and ran Art at Exhibition. From 1983 she was a tutor at City and Guilds of London Art School. She has also worked with asylum seekers for a human rights lawyer. 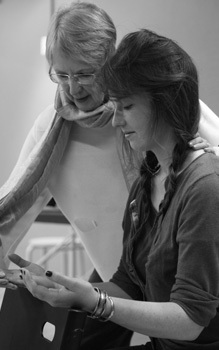 Mary Anne has been a pupil of the Alexander Technique with Ruth Murray at the Constructive Teaching Centre for three years. James, LLB Hons, is Barrister at Law. He has worked for a variety of Investment Banks as an equity financial analyst and salesman, and in a number of senior management roles for Paribas, James Capel (HSBC), Salomon Brothers, Citigroup, and Man Group. He recently retired as CEO of Cantor Fitzgerald in Europe. He is a pupil of the Alexander Technique. Christopher is the eldest son of Dilys and Walter Carrington. After leaving school in 1960, he joined the Royal Air Force as an officer cadet at the RAF College, Cranwell. He graduated as a pilot in 1963 and after several flying appointments, served in the Ministry of Defence and NATO Headquarters in Brussels. After retiring from the RAF in 1991 he worked in London as financial controller and company secretary for a not-for-profit organisation. In 2001, he ceased full-time employment to accompany his partner on her diplomatic appointments overseas. Now fully retired Christopher is living in west London.